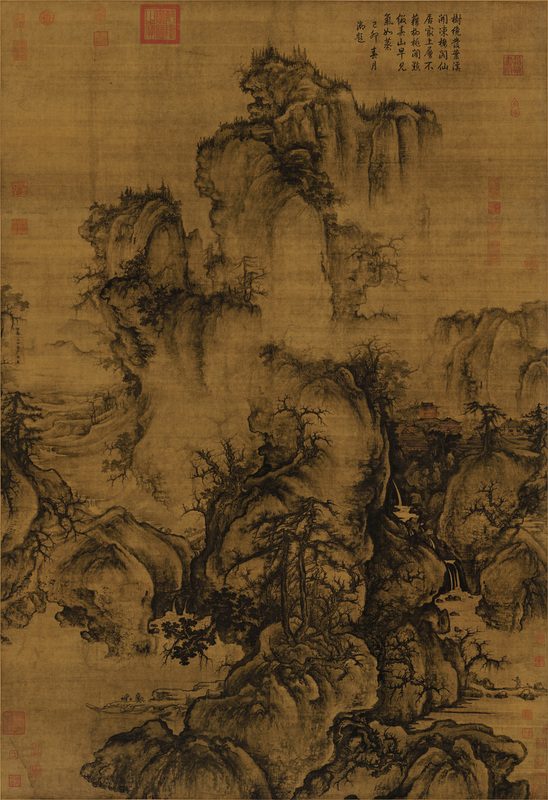 This work, done in 1072, is Guo Xi’s most famous masterpiece. He entitled it “Early Spring,” and, accordingly, auspicious clouds on an early spring day appear enveloping the landscape after just having emerged from winter—full of potential for life and renewal. Suggested by forms emerging from the mist, the land seems to awaken as the trees spring forth. Guo Xi arranged the main elements of the monumental landscape along the central axis of this vertical scroll. Large landforms and pine trees in the foreground connect with the “S”-shape of the middleground. Following a break with the mist, the slope climbs up and continues into the winding central mountain in the back. Deep distance penetrates to either side of the mighty mountain as winding forms are complemented by the diagonal breaks of streams and waterfalls. Lofty halls and pavilions along with a thatched-roof kiosk are tucked deep in the mountains to the right. The flat distance to the left creates an expansive horizontal vista that complements the dizzying heights of the mountains. The ink is light yet rich, while the composition combines the techniques of tall, deep, and flat distances, making this an ideal landscape for walking, viewing, living, and traveling in the imagination.